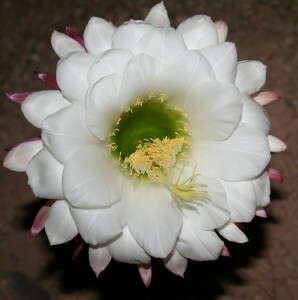 I’ve been blessed to have some of the most amazing catcus blossoms in my front yard in Peoria, Arizona. 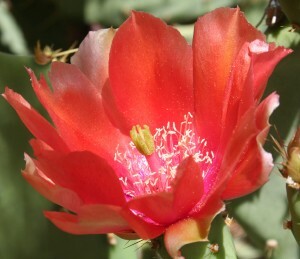 Most are in the prickly pear family, with one transplant: a Giant Argentine. See below. It’s been a joy to watch the hundreds of bees over the months as they dive into the blossoms and do their pollen thing. Wonderful lessons from nature as I shoot picture after picture. Practice is good. This past week my brother and I drove a little west to the White Tank Mountain Regional Park to hike the Waterfall Canyon Trail. As I mentioned in my last blog post, I didn’t make it all the way. However, I was in for a pleasant surprise: Petroglyph Plaza. 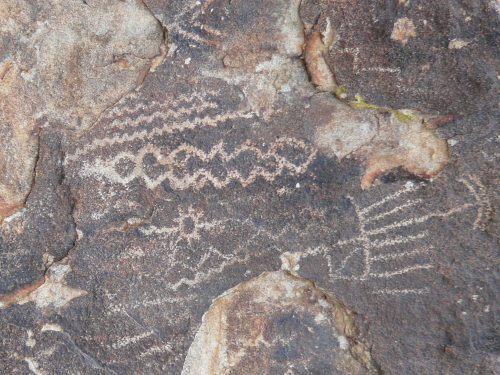 There are ever so many rocks of varying sizes that have petroglyphs. Two Petroglyph styles have been recorded at the park. : Archiac Style and Hohokam Style (also called Gila Style). The Hohokam apparently abandoned the White Tank Mountains about 1100 A.D. These delightful images depict such things as game hunting, history, marking the landscape, sky watching, and spiritual life. If you live in the Valley, or plan to visit, you might want to consider taking this hike. Below are two graphics. 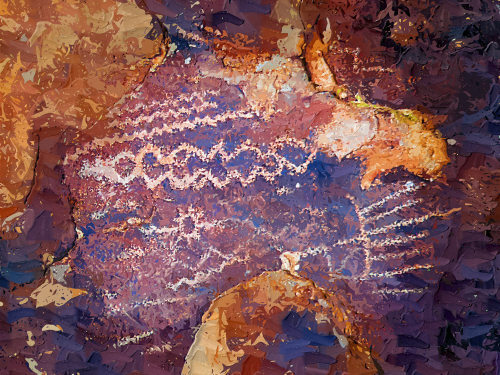 The first is an original shot of a rock covered with petroglyphs. The second is the same photo, except redigitized by me. I always “see” more than the camera! I look forward to another visit soon and especially to the Black Rock Trail. P.S. There is a nearby horseback riding stable and a brand new county library and nature center. The White Tanks are close to many other places: Wildlife World Zoo and Aquarium, Luke AFB, Sun City, Peoria, and Litchfield Park. Don’t be so quick to judge sloths! Have you ever been accused of being a sloth? 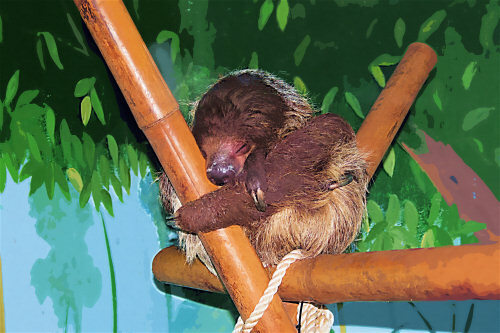 Above is a picture I took this week at the zoo: a sweet little sleeping sloth. Cute, yes? And there are good reasons that sloths move slowly. Very slowly. It’s all about their metabolism and digestive process. Sloths are classified as folivores as the bulk of their diet consists mostly of buds, tender shoots, and leaves, mainly of Cecropia trees. Some two-toed sloths have been documented as eating insects, small reptiles and birds as a small supplement to their diet. Yum! 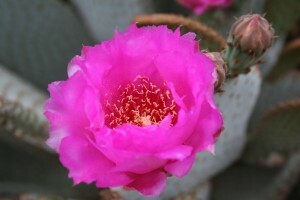 Leaves, their main food source, provide very little energy or nutrition and do not digest easily. Sloths therefore have very large, specialized, slow-acting stomachs with multiple compartments in which symbiotic bacteria break down the tough leaves. As much as two-thirds of a well-fed sloth’s body-weight consists of the contents of its stomach, and the digestive process can take a month or more to complete. Wikipedia. 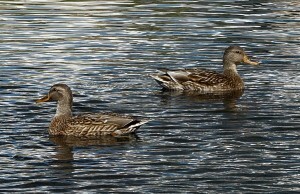 Recently I went to a nearby industrial park in Glendale that has some beautiful water birds. So far this fall I’ve only seen mallard ducks. This summer the pond was drained and left for awhile, and just recently did the mallards show up. I’m hoping the white-crested ducks make an appearance, and some gorgeous geese, but it probably depends on the management of the park. Unless they are independent, and park wherever they want. Come to think of it, there were a couple of ducks in my back yard about five years ago. So who knows? Maybe the other ducks and geese have been up in the mountains during the summer. Can’t blame them. 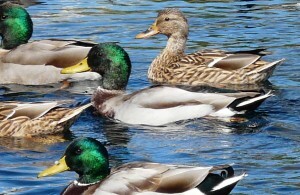 The word duck comes from Old English *duce “diver”, a derivative of the verb *ducan “to duck, bend down low as if to get under something, or dive”, because of the way many species in the dabbling duck group feed by upending (Wikipedia). 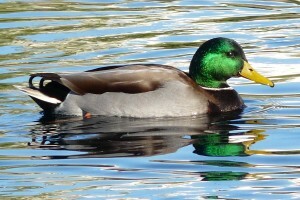 Mallards are beautiful creatures. 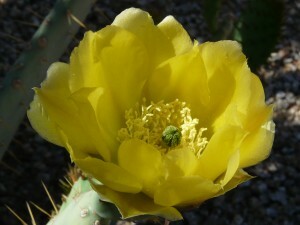 The males are especially beautiful, but a thorough look at the females reveals a dignified, design-rich beauty as well. Just more subdued. Wikipedia says that some people use “duck” specifically for adult females and “drake” for adult males, while others use “hen” and “drake,” respectively.